I had an amazing experience with the Clarisonic Plus this weekend; I used the Body Brush attachment for the first time. Even after showering and bathing since then, my skin still feels incredibly soft and smooth. As we’re teetering on the edge of summer, I thought I’d use this tale of incredible exfoliation as the inspiration for a post all about the best in body scrubs. So whether you want a more even and perfected tan, refined texture, or just nice soft skin, take a look at the picks below. 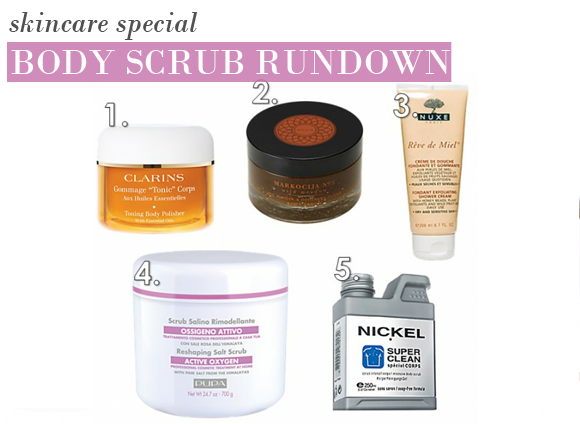 If you’ve neglected your skin over the winter, then this is the scrub for you. It’s pretty intensive, with lots of chunky sea salt and sugar granules suspended in a smoothing Shea Butter-based wash. You only need the tiniest bit to make a big impact, and it’s particularly good at toning and smoothing the upper arms, the thighs and the stomach. The formulation is also packed full of stimulating Mint, Rosemary, Rosewood and Geranium essential oils to detoxify the mind as well as the body. This scrub smells absolutely delicious! Its blend of mimosa and iris soothes the senses and makes for a really gorgeous shower experience. If your skin isn’t too bad following the winter but definitely needs some attention, try this blend of Demerara sugar crystals along with sunflower, lavender and jasmine extracts to whip your skin into shape. The slightly chunky sugar crystals stimulate circulation and get rid of dead skin cells, while the floral extracts improve elasticity, tone and overall skin appearance. This scrub has the most delicious texture and feel, is very gentle on the skin, and doesn’t dry the skin out. This makes it ideal for weekly use by those with sensitive skin, and is also ideal for other skin types as a daily top-up to keep skin looking and feeling smooth. The gentle exfoliant is made up of 100% vegetal Honey Beads that gently buff away dead cells and refine the skin’s texture, while an infusion of Orange Flower Honey and Sandalwood oil plies the skin with loads of lovely moisture. This incredible scrub works to drain excess fluid from the tissue with natural extracts of active Oxygen, Pink Himalayan Salt and Bladderwrack Extract. The skin becomes more toned and supple, with a big boost of energy and a significant reduction in water retention and toxins. Skin is regenerated with each and every use, and the mind is soothed with the Reshaping Salt Scrub’s distinctive spa-like scent. This hardworking exfoliator from Nickel is perfect for men who need daily scrubbing. Its deep-down clean is especially good for those with an active lifestyle as it works to dislodge even the most stubborn dirt and grime. The caring pistachio extract makes sure that the skin is left feeling supple with no trace of tightness, and the fresh scent revives the senses every morning. An excellent product. I love the smell and the effect. I only wish it came in a large tube rather than a tub. I would prefer more accuracy in the application. I found using the spatula (or scooping with my fingers) fiddly and sometimes messy. It's a minor criticism and maybe says more about my fine motor skills! This entry was posted on Wednesday, June 1st, 2011 at 8:46 am and is filed under Hints & Tips, Skincare. You can follow any responses to this entry through the RSS 2.0 feed. You can skip to the end and leave a response. Pinging is currently not allowed.